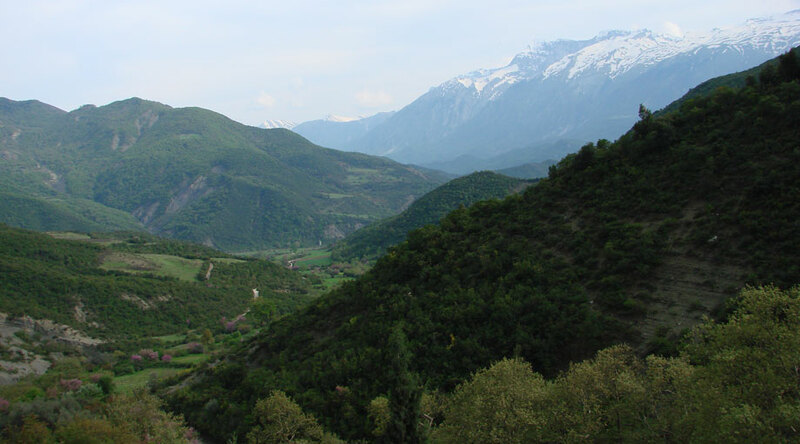 The study area of the Upper Part of the Vjosa Valley is situated in the Southeastern part of Albania, and covers a territory app. 400km2 extended on both sides of the River Vjosa. 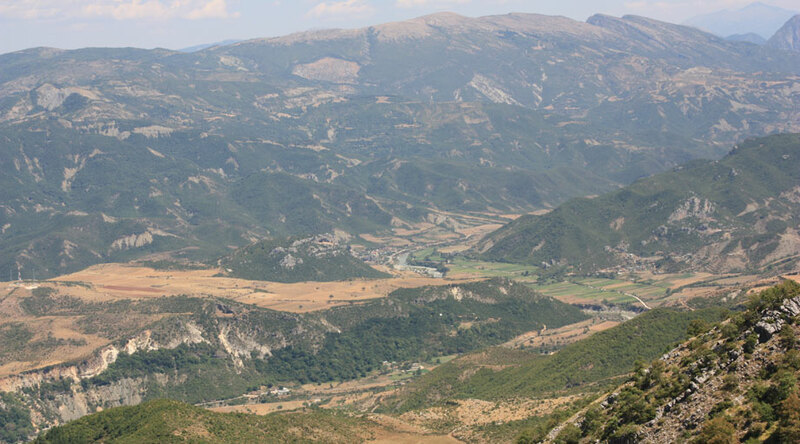 The modern Greek-Albanian border confines the southern extreme while to the north, its limits are defined by the geographic point of the Gorge of Këlcyra, expanding in a linear line of 45 km. This territory is part of the southern Highland Region of the country, and presents a quite well arranged relieve, alternated between mountain ranges and river valleys. To the west of the study area and on the left side of the River Vjosa flow, in a SE and NW direction run the mountain range of Dhëmbel (2050 m high) –Nemërçkë (2485m high), while the territories to the right of the River flow, far within the valley are occupied by the highlands of Çarishtë and Dangëlli. The Upper Vjosa river bed is deeply incised, cutting through up to 10-15 metres of conglomerate deposits, providing thus a protection from land erosion and over-bank flooding for the surrounding territories. However, the erosion coming form the hilly terrains next to the river terraces creates alluvium deposits on the lower fields of the river terraces. 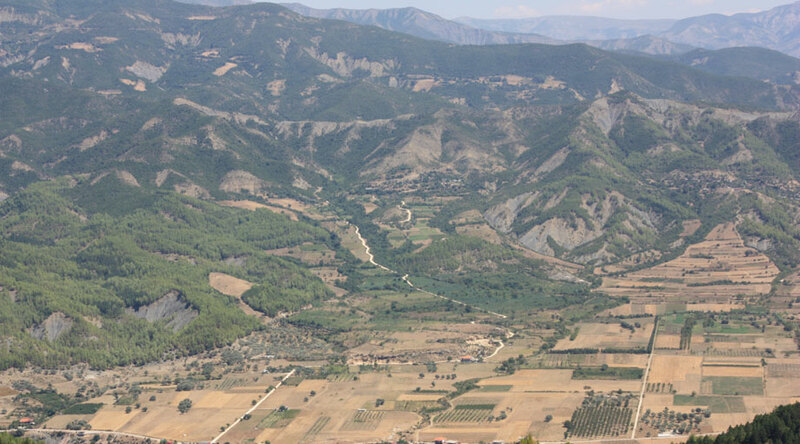 This region is dominated by a typical hilly Mediterranean climate, with an average annual temperature of 15° C and an average annual rainfall that reaches 1, 300 mm/year. The mountain ridge on the western side and the hilly territory on the east create favorable natural protection from the harsh winds, diffusing those arriving from the northwest (from the Adriatic Sea at the mouth of Vjosa River). These natural and environmental conditions appear to have conditioned a continuum and stable occupation of the territory. Thus, a series of villages inhabited at least since the beginning of the Ottoman period (early 15th cent. 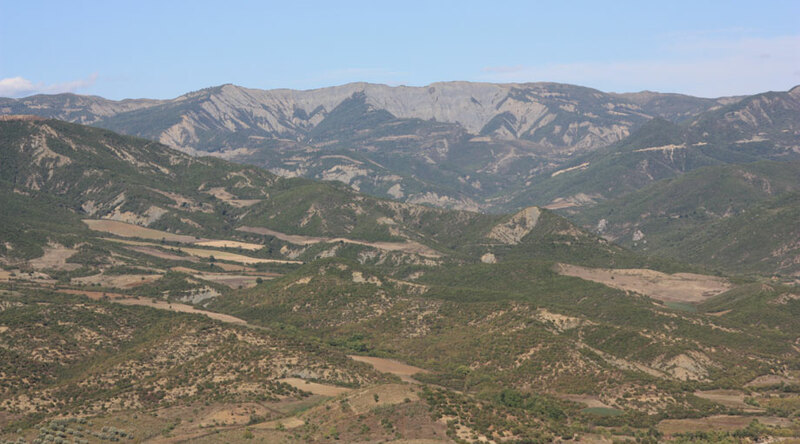 ), are located at a distance of 4-5 km from the riverbank, occupying the flysch stratum of the moderate lying hill slops on both sides of the river. Despite the frequency of these habitations which give a profound rural character to the Upper Part of the Valley, the small towns of Përmet and Këlcyrë, documented as administrative centers by ottoman cadastres, are located between flat and sloppy terrains, quite close to the river banks.